I just got back from two weeks in Miami for Art Basel. I was involved in a non-PublicAdCampaign related event called the Underbelly project. While the project is unrelated to advertising it is highly caught up in notions of public access and participation with the public environment. Here at PublicAdCampaign we see advertising in public space as a barrier to a more open public interaction with public space. The Underbelly project throws notions of public/private, legal/illegal, out the window and uses our shared environment to create monumental myth and culture. I couldn't prouder to be so integrally involved in this amazing endeavor and hope PublicAdCampaign readers will take a minute to have a look at what the Underbelly project has done. That said, lets get back into some advertising related posts cause PublicAdCampaign has a lot do bring you in 2012! Here's a Baldessari billboard for the high line. Ill have a look at it on my way to the studio tomorrow but I'm already excited that this once advertising billboard has become a viable art venue. 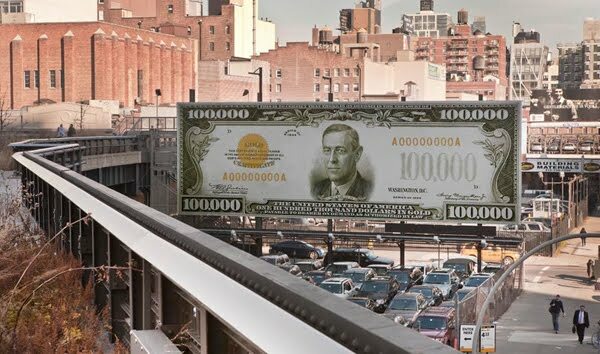 Now if we could only return the rest of the eyesores along the High Line to the public interest.